A discussion on the Scottish Beekeepers forums last year (and the price of foundation) prompted me to try foundationless frames. 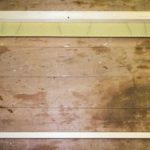 The general principle is that you build standard brood frames, reinforced with horizontal wires or fishing line, containing only a narrow starter strip of foundation. 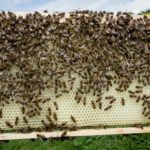 The bees build new comb, incorporating the strengthening wire or fishing line, without being constrained to the cell dimensions of the underlying foundation. The starter strip encourages them to build comb in the orientation you want. Without starter strips as guides it can be a bit of a free for all. First impressions are very positive. During routine comb replacement or a Bailey comb change the frames have been drawn out very well, with beautiful near-white comb. 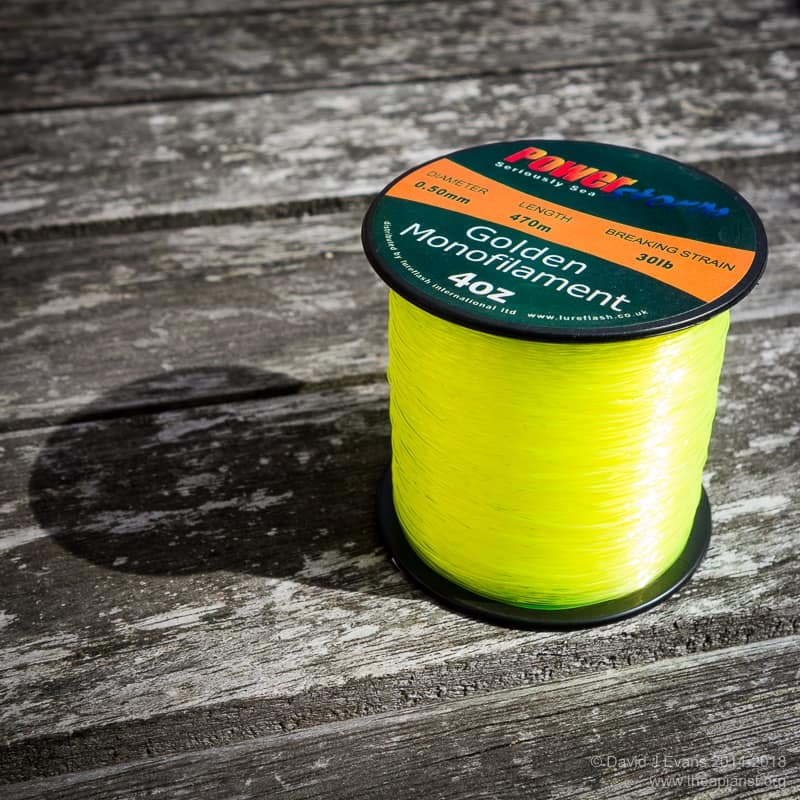 The fishing line has been incorporated as intended and the comb appears reasonably robust – with the caveat that there have been no really hot days yet which can make the comb much softer. This shouldn’t be an issue once they’ve raised a couple of rounds of brood in it. 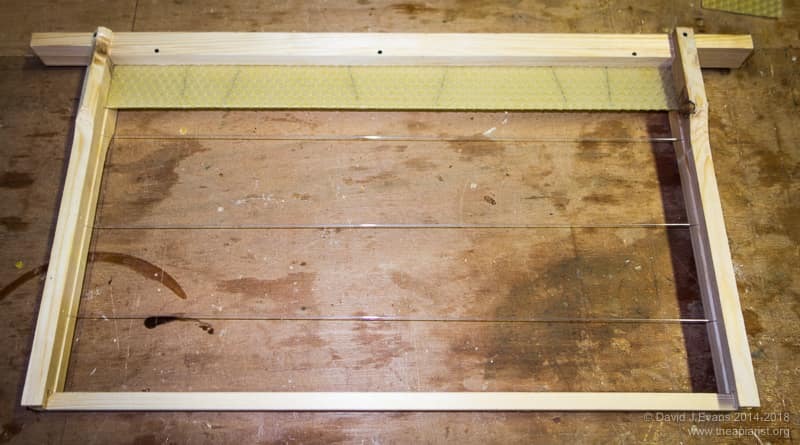 The bees join the foundation to the side bars but often leave gaps at the bottom corners and/or along the bottom bars of the frames. They build a lot more drone comb, though the amount varies and reflects the strength of the colony. Very strong colonies seem to build much more drone comb, whereas nucs do not. I presume this is the bees regulating the colony composition as they want. 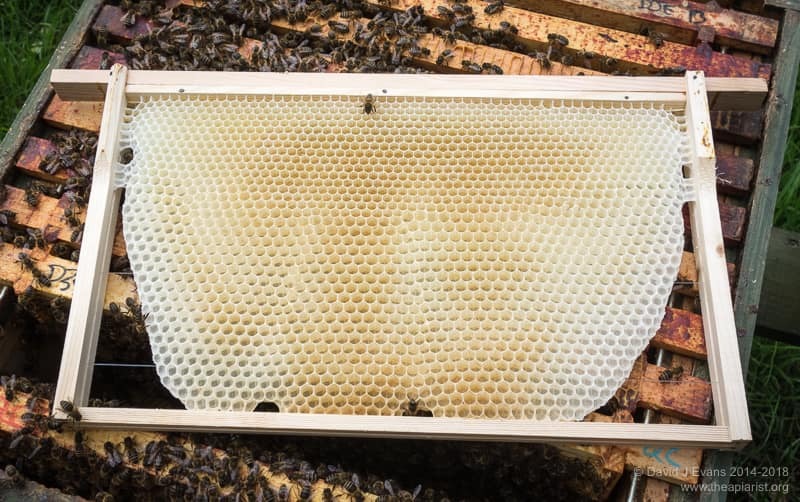 The only problem I can foresee here is that drone brood removal will be less easy from one of these frames than by simply slicing off a lump of brace comb built on the bottom of a shallow frame. During a recent Bailey comb change it was noticeable that the queen first started laying in newly drawn comb on a foundationless frame, rather than the flanking frames with commercial foundation. 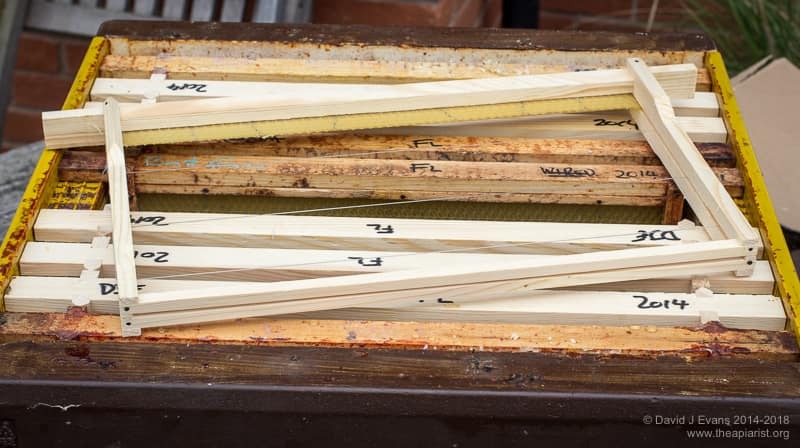 I build the frames from second-quality parts (purchased at one of the beekeeping shows). Since these cost about £27 for 50 and you use ten times less foundation I estimate 50 prepared foundationless frames cost about 60p each … in comparison, using first quality frames and full sheets of foundation they cost a fraction under £2 each. These costs are based on our co-operative purchasing scheme prices for foundation which are already pretty good. Take care to inspect the second quality frames if you get a chance. The wood needs to be sound but the dreaded off-centre foundation grooves (which otherwise mess up beespace with full sheets of foundation) can be safely ignored. 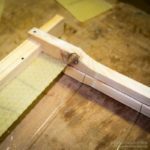 I knocked a couple of 2″ nails into a block of wood to act a register points for the notch in the side bars. I then drill three roughly equally spaced 3mm holes through pairs of side bars. 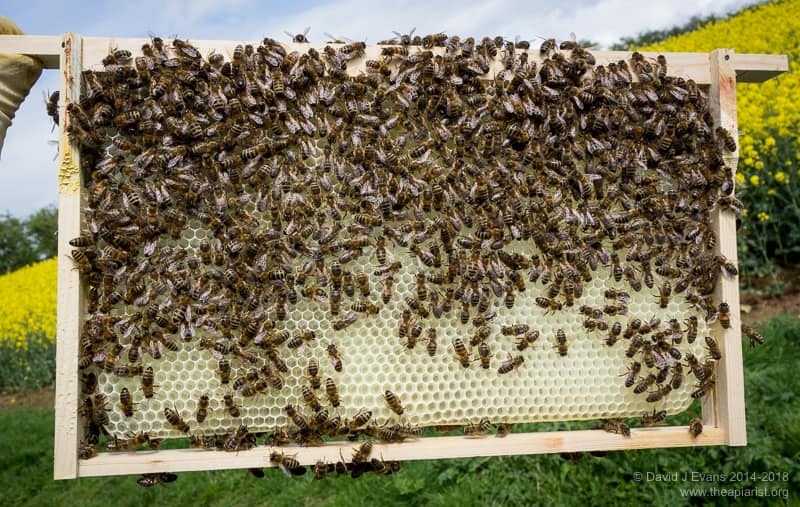 I’ve read elsewhere that the bottom wire/line support benefits from being closer to the bottom bars of the frame because – as explained above – the bees often do not completely seal the drawn comb to the base of the frame. Having assembled the frame in the conventional way I use 15kg fishing line secured with drawing pins or gimp pins rather than wire. 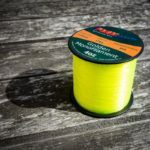 There is at least one set of photos I’ve seen where the wire is relatively poorly incorporated into the drawn comb – I’ve not noticed this happening in any of the three dozen fishing line ‘wired’ frames I’ve used this spring. Tie a simple overhand loop in the end of the line, place it over one pin at the ‘top’ of the frame, hammer it home then thread the free end of the line through the frame. To secure at the end I pull the line tight and wrap the line half a dozen times round a second drawing pin before hammering it home. 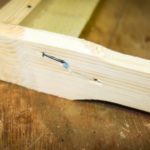 To stop the line cutting deeply into the soft frame side bars you can use standard staples (just like you use for holding sheets of paper together … nothing too industrial) which can easily be pushed into the wood. Alternatively, I’ve used gimp pins knocked in next to the hole and hammered flat. Remember you only need a staple/pin one the side of the hole. The fishing line needs to be tight enough to provide rigidity; not so tight you can play a tune on it. A standard sheet of foundation is about 20.5cm deep. I cut this into 2cm strips, easily cutting through the wire with a Stanley knife. I secure it in place under the top bar in exactly the same way you would fit a full sheet of foundation. I’m pretty sure you could use an even thinner strip as a template for the bees to start from. Michael Bush describes simply breaking the wedge out of the top bar and nailing it back perpendicular. There are also various suggestionss about using a strip of melted wax or a wedge shaped top bar. I suspect that a thin strip of foundation is probably the easiest of the lot … it might be even more economic to use unwired super foundation. I’ve used these foundationless frames one at a time between standard drawn frames of foundation – either in full colonies or nucs. They are readily drawn out and beautifully straight (though see the comments below on having a level hive). For Bailey comb changes I’ve added an upper brood box of alternating foundation and foundationless frames. There have been no problems with brace comb or the bees building comb in the wrong orientation. Finally, in my bait hives I’m using 9 foundationless frames flanked by two old tatty drawn frames. These have only been out a few days this year and have yet to be occupied. STOP PRESS … they are now, and the foundationless frames worked a treat. Bees build comb vertically. When drawing out foundation they have little choice but to follow the sheet. 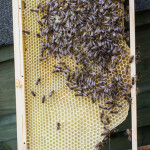 In contrast, if there is a significant slope (presumably front to back) and you arrange frames the ‘warm way’ there is a danger that the beautifully clean comb they draw out will not fit between frames using foundation, or that you’ll not be able to turn the comb around without messing up the beespace. 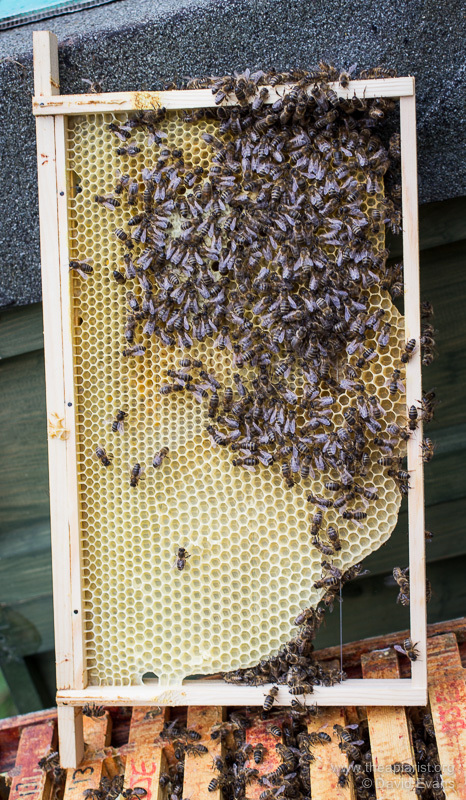 If the hive does slope front to back – for example to help water drain out (why is it getting in? Perhaps try a Kewl floor) – you should be able to avoid this by arranging the frames the ‘cold way’. 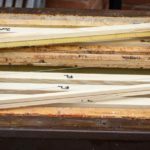 Chris Slade has an excellent account of building and using foundationless frames on the recommended Beekeeping afloat blog. Tom Bick started an interesting thread on foundationless beekeeping on the Beekeeping Forum. (Inevitably … he covers most things) Michael Bush also has lots of information of foundationless frames at Bush Bees. 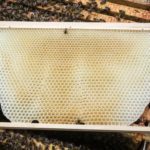 This entry was posted in Beekeeping, DIY, Frames and tagged Bailey comb change, DIY, drones, foundationless, frames on April 29, 2014 by David. Nice post and glad that you are finding that foundationless frames works well for you. I do a bit of drone cull, but not that much these days every now and then and only to reassure myself I don’t have a varroa problem. Actually I would say the varroa is less of a problem with foundationless frames than with foundation despite the extra drone comb. I have a theory that the bees detect problems with the drones at an early stage and as they see the drones as dispensable they uncap and throw them out of the hive with the underdeveloped varroa. I think the bees can only detect this in the drones with the thin mid rib natural comb has, as the thick mid rib of foundation dampens vibrations. Its not an exact science, but perhaps gives the bees that bit more of a chance. Ps any luck with the bait hives. I’ve caught two swarms with bait hives set up with foundationless frames in the last week … as soon as the weather has improved a bit I’ll check them carefully and post something here. First impressions are that the swarms have built out the frames without foundation very fast. Thank you for a very interesting and useful post. As you posted in 2014, I wondered how you have found things a few years on? Are the results still as positive? I still like them … and so do the bees. I guess about half the frames I use are foundationless. They’re always in my bait hives and incoming swarms start building without delay – just make sure the frame hangs vertical. I’ve still not got round to making my own foundation starter strips. I’ve got kg’s of recovered wax ready to go, but am still working through stockpiles of prepared foundation. The only downside is putting foundationless frames through the steam wax extractor … the nylon monofilament loses it’s tension and they need to be “restrung”. Wire would avoid the need for this. Give them a try. What have you got to lose apart from 80%+ of your outlay on foundation ?